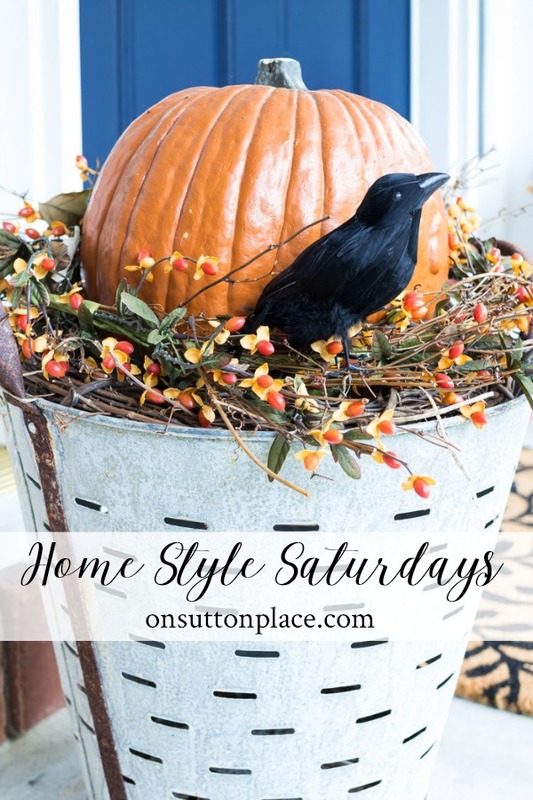 Home Style Saturdays: dining chairs makeover, chinoiserie and velvet pumpkins, fall decor for inside and out, adding Halloween to your existing fall decor. Here in Ohio, it sure doesn’t feel like it’s almost the first day of fall. Nevertheless, it’s time to completely embrace the season and hope that cooler temps are just around the corner. 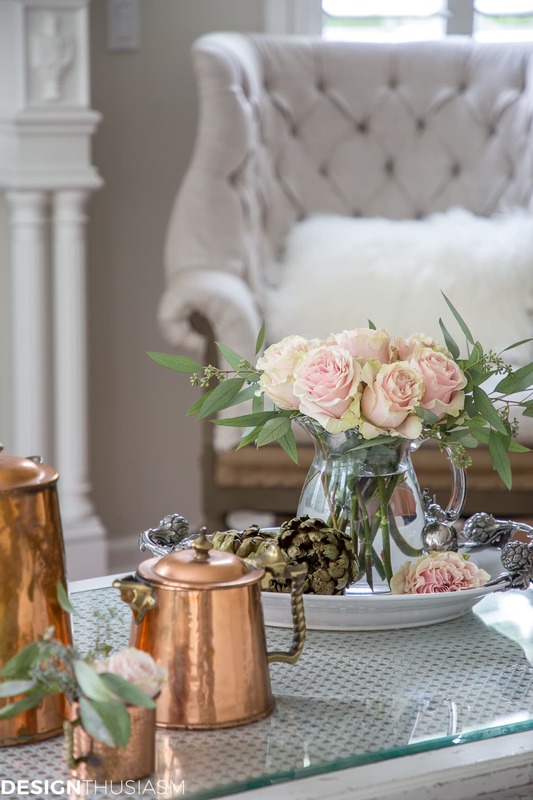 I’m finished with my fall decorating and will be sharing a few more ideas soon. I’m also putting the finishing touches on the 2019 calendar and plan to post it on September 30th. 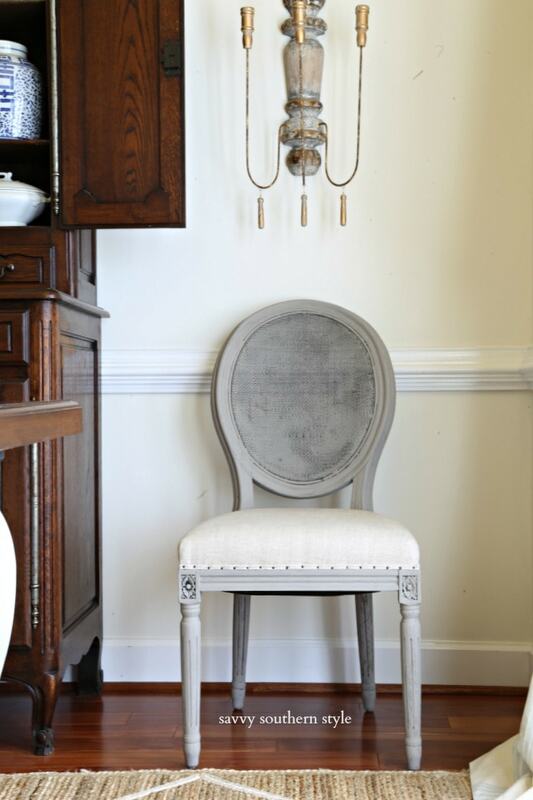 If you aren’t an email subscriber, I want to personally invite you to join the OSP community. That way you can stay in touch and not miss a thing. I’m getting into the fall mode – we had lots of rain yesterday and the temps cooled down, well, cool for OK at this time of the year. I read one of your posts about preserving gourds. I’ve done that, cleaning the dirt and mold, then letting the gourds dry naturally. After cleaning them again, I painted the ones that looked like huge apples with red paint, then buffed brown shoe polish to tone down the red and add a shine. Other gourds, I just used the shoe polish. They look wonderful and have been hiding high up on shelves. 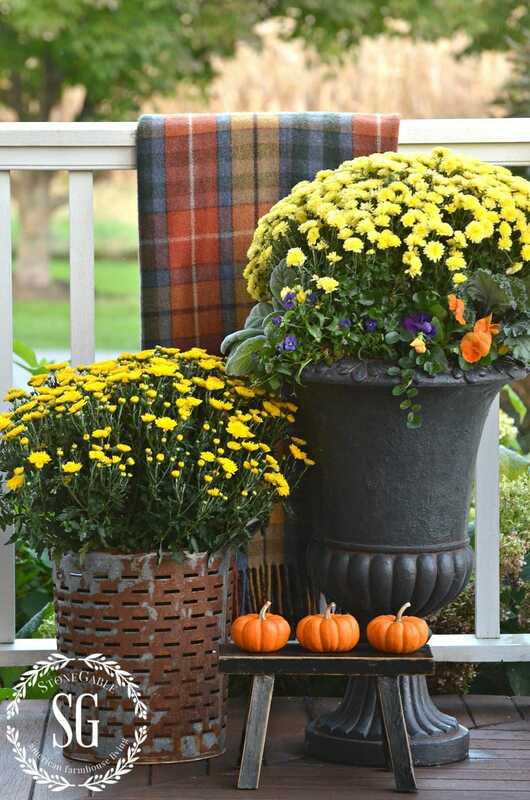 I just brought them down, dusted them off and will add them to the porch with fall flowers. But, I’ll look for some more gourds this year to clean and display this year and then dry in the garage over the winter, and paint for next season. 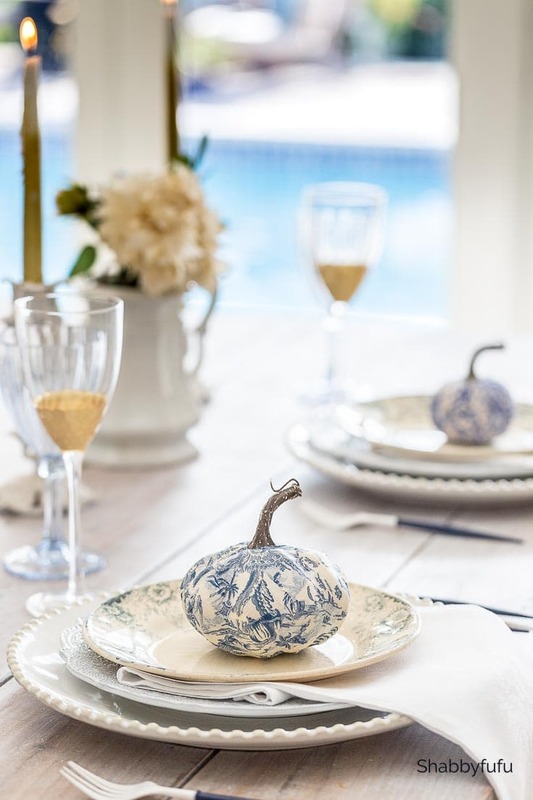 The advantage is that the gourds are real, not plastic, and can be painted, waxed or whatever. And the ones I paint to look like apples can be used in other arrangement. And, obviously, they last for a long time! Thanks for re-inspiring me for fall decorating. 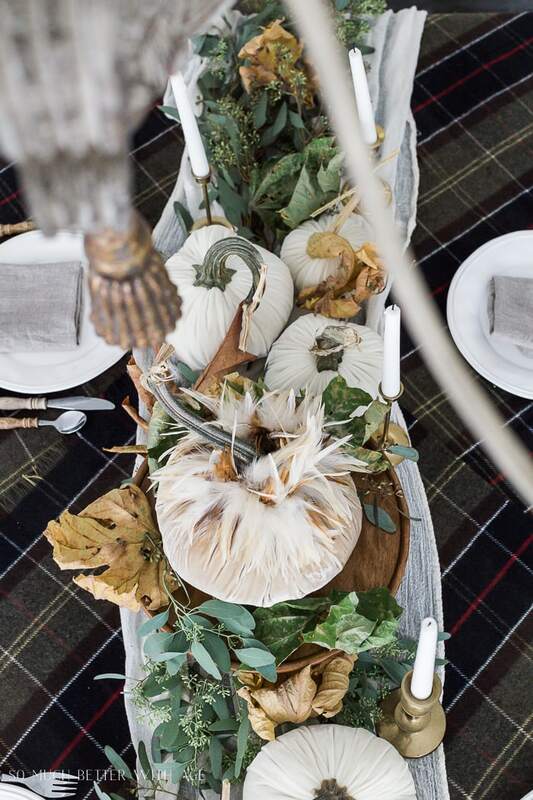 Thank you for sharing all of this…what a wonderful way to get custom fall decor. Good job! I LOVE the Fall and could feel the excitement bubble inside me as I was reading your post. I am a lifelong DIYselfer, arts and crafts person and after looking at some of your ideas I am so ready to get started. The pumpkin on the bucket with the crows looks simple but amazing. Thank you for the inspiration…I can’t wait to get started! 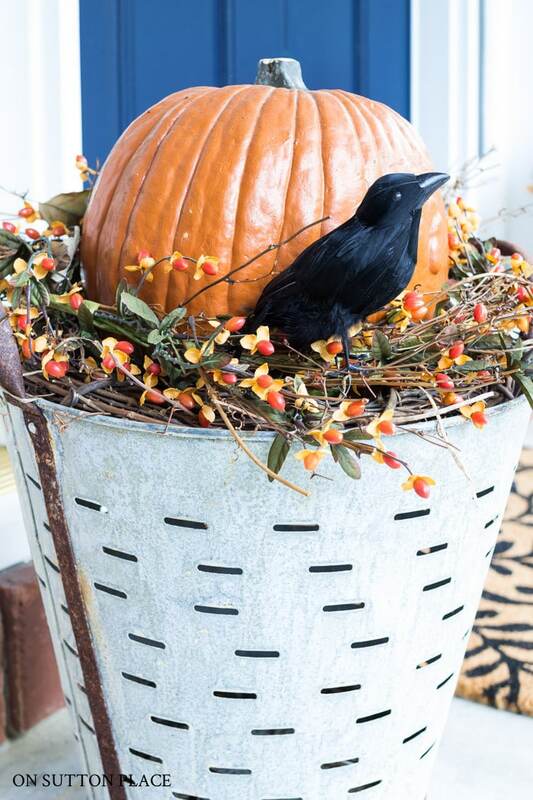 Love the rustic simplicity of the olive buckets with the pumpkins and vines, the crows were a nice addition. I’m not a fall person but you all are inspiring m e.
I love Saturday mornings with you. Each weekend I find something inspiring. And by the way, it was 91 here in western NY yesterday. We will be in the 60s all day today. Fall has finally arrived. Brr. It was 62 degrees out in Mentor when I took Daisy out. Only be 69 when I go to the airport to bring my fiancé home from the war in Syria. Done done done with writing notes. On Saturday driving to new home in Austin. Will miss you Anne knowing we were in the same place. But so happy to start a new chapter in my life.